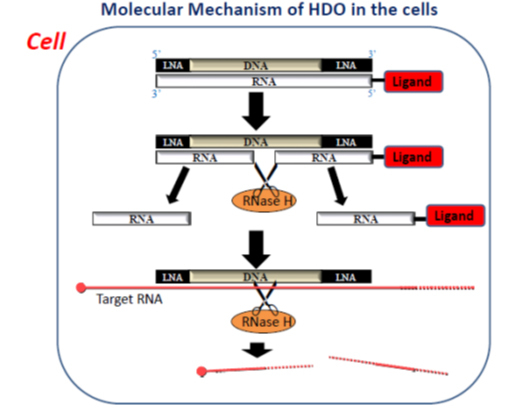 HDO is found to be significantly potent at reducing expression of the target RNA, and also improves the phenotype in disease models effectively. In addition, the high potency of vitamin E-conjugated HDO results in a reduction of liver dysfunction. HDO technology was expected as basic technology of molecular targeted therapy. “Two major types of RNA targeting oligonucleotide drugs are currently being developed as therapeutic platforms for reduction of target gene expression; short interfering RNA (siRNA) and RNase H dependent antisense oligonucleotides (ASO).” says corresponding author Takanori Yokota, MD, PhD, professor of department of Neurology and Neurological Science at Tokyo Medical and Dental University. Like any medical drugs, despite progress in the design of oligonucleotides, methods which further increase potency of oligonucleotide drugs and improve safety and tolerability are highly desirable. The insufficient delivery, poor cellular uptake of oligonucleotides and their inefficient access to target RNA are major impediments to in vivo silencing. Then Yokota and colleagues developed a novel short DNA/RNA heteroduplex oligonucleotide (HDO). “HDO has a structure different from double-stranded RNA used for siRNA and single-stranded DNA used for ASO, and different functional molecular mechanisms from siRNA or ASO in the cells.” says Yokota. Toc-HDO is significantly more potent at reducing the target messenger RNA compared to the parent ASO. The first author, Dr. Nishina measured the Effective Dose 50 (ED50) which means the dose required 50% reduction of target gene, Toc-HDO targeting Apolipoprotein B (ApoB) mRNA (ED50, 0.038 mg/kg) was 22.2 times more potent than the parent ASO (ED50, 0.841 mg/kg) in liver. In addition to lowering ApoB mRNA the Toc-HDO can reduce serum low-density lipoprotein (LDL)–cholesterol and the pharmacological effects lasted more than one month at a 0.75 mg/kg of Toc-HDO injection only, not at ASO injection. Mipomersen, the first oligonucleotide drug, was approved by FDA, but not by EU due to liver toxicity.